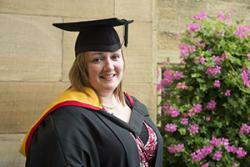 After three years of hard work, an award-winning student graduated from Bangor University week. In addition to receiving a BA Primary Education QTS degree, Gwawr Thomas, 33, from Llangernyw received the Normal College Sponsorship prize of £500. This prize is awarded to a bi-lingual student that is eligible to teach through the medium of Welsh, who is outstanding in the school experience part of their third year of the Initial Teacher Training course. Gwawr has worked in education for many years as a Senior Classroom Assistant, but longed to be teacher. Three years ago, Gwawr decided that her children were old enough to enable her to do exactly that; therefore, she took the plunge, left her job and went to University to pursue her dream. Very pleased with her success, Gwawr said: "It feels amazing to be graduating, knowing that I’ll have my degree forever. It is also an exciting time for my family. "The privilege of being awarded the Normal College Sponsorship prize is a great feeling. It means that all the hard work during the teaching practice was valued and recognised. This gives me great confidence at the beginning of my teaching career. "I chose Bangor University on the basis of its excellent reputation. It was also in daily commuting distance. "Even though I wasn’t working while I was at University, housekeeping, cooking, reading and helping my children with their homework was a bit challenging at times; but I persevered and found the balance to be able to succeed. "During the work experience part of the course I got a chance to spend time in the three great schools. I participated in a Christmas fair in my second year and we won a prize for the best stand. "It’s been a long and tiring journey at times, but I've enjoyed every minute of it. Soon, I hope to study for a Master's degree through the University whilst in my new teaching job."